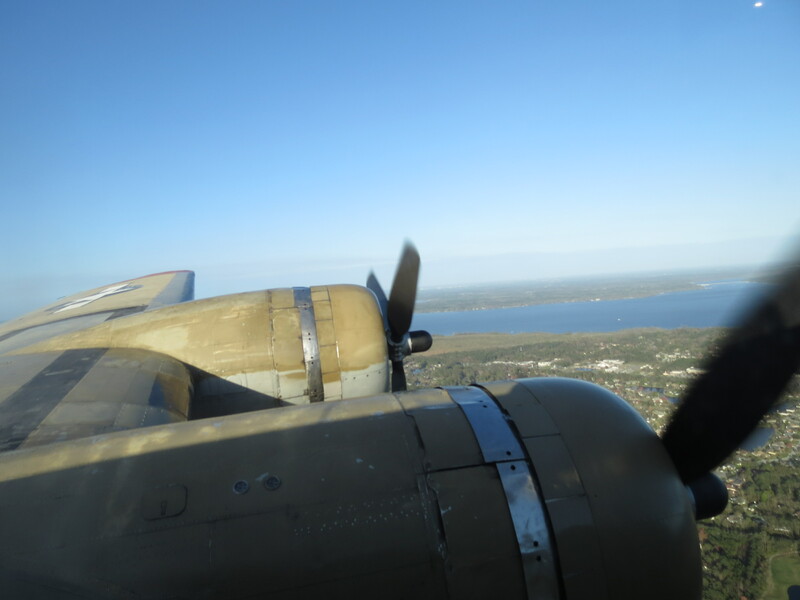 Last February when we went for a ride on the B-17 Nine-O-Nine, we also got an up-close view of the B-24 Witchcraft. The Collings Foundation had three WWII vintage airplanes on display that day and all flew passengers. 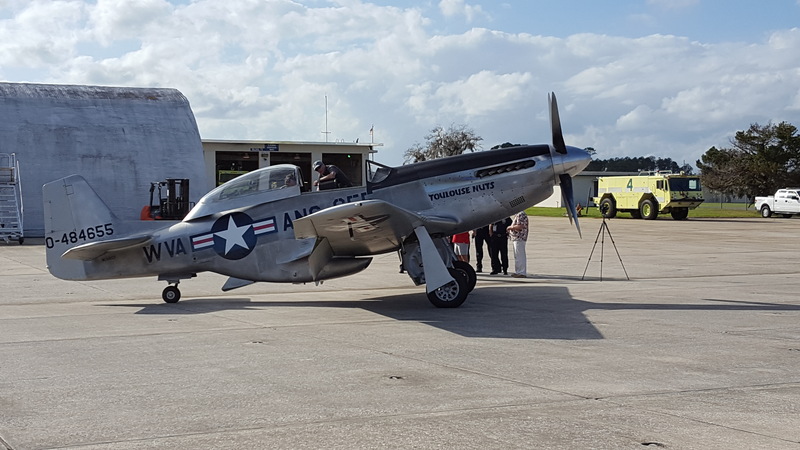 The third plane was a P-51 Mustang or, more specifically, a TF-51D Mustang which is a two-seated training fighter. Since it was in the air most of the afternoon, we didn’t get as close to the fighter. While researching for my novel, Kitty’s War, I read up on America’s two heavy bombers trying to decide which one to use in my story. The B-17 won out but I was impressed by the B-24’s capabilities. The B-24 Liberator was a heavy bomber designed by Consolidated Aircraft. It’s design was more modern than Boeing’s B-17. The B-24 had a faster speed, heavier load capacity and the ability to fly at higher altitudes. Many crews preferred the B-24 over the B-17, but the B-17 had a reputation for making it back to its home base despite heavy damage. The B-24 had a tendency to break up when heavily damaged, especially when it hit the water. That’s because of the structure and location of the bomb bay. 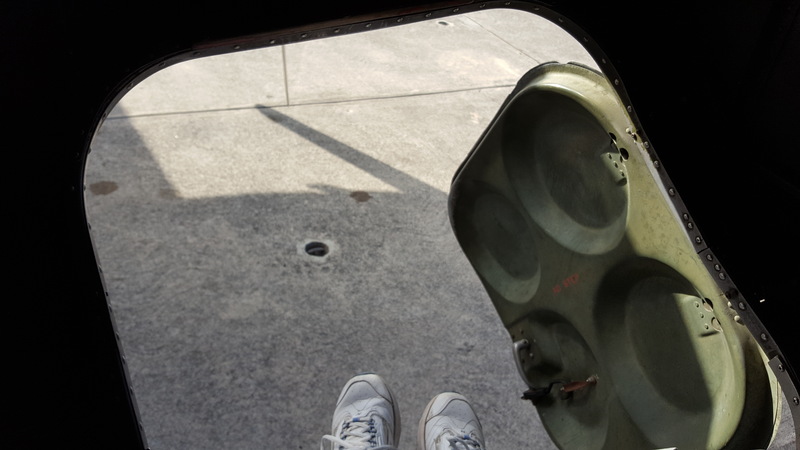 I climbed inside the Witchcraft to get a feel for the aircraft. Pictures from inside show the ammunition boxes and the oxygen bottles. 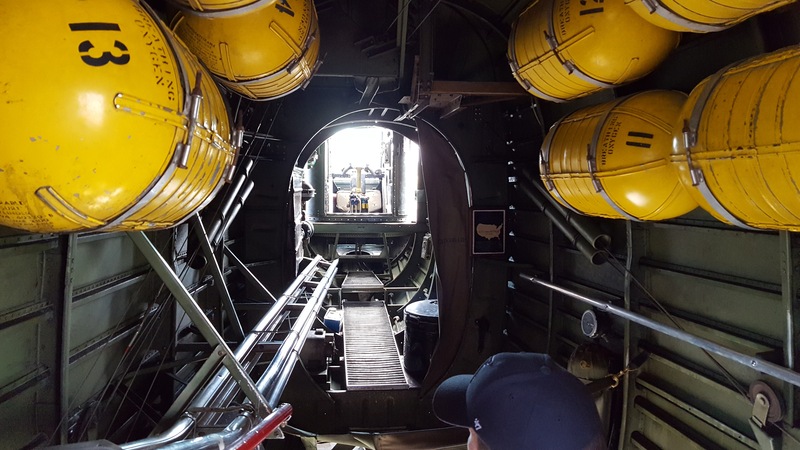 Looking from the waist gunner positions behind the wings forward through the bomb bay you can see all the way to the bombardier’s seat. 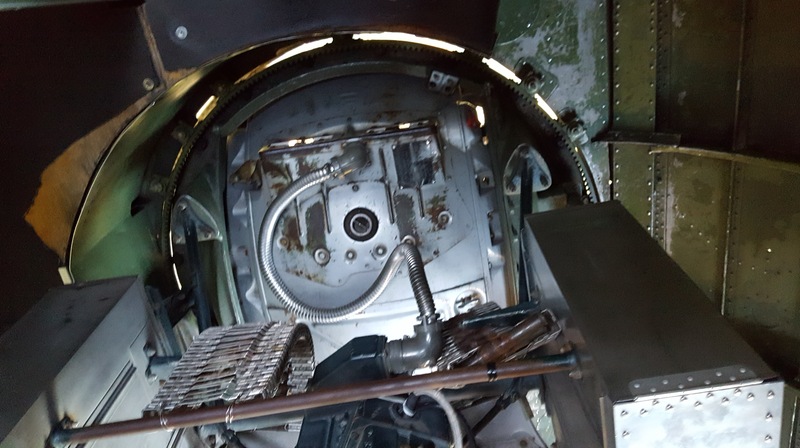 The walkway through the bomb bay was wider and less obstructed than on the B-17. I didn’t get into the nose of the B-24 where the Bombardier sat. 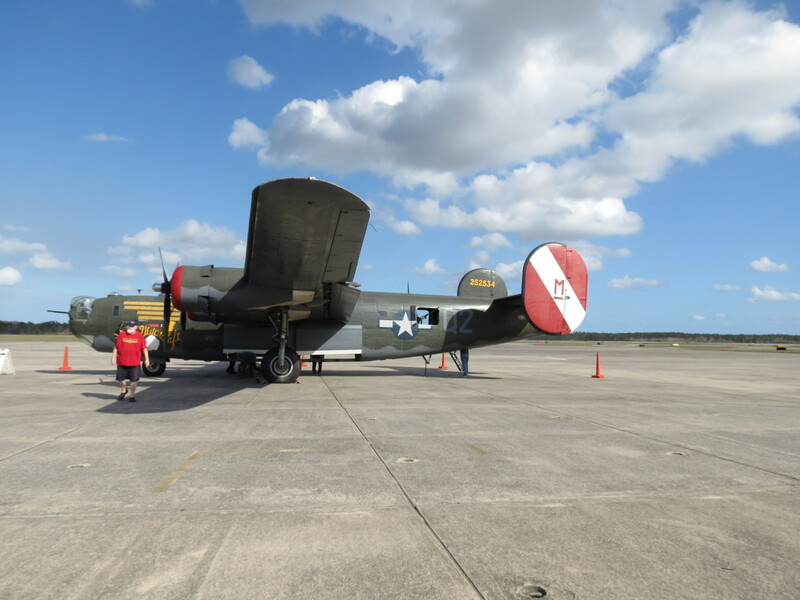 The B-24 was the plane that Jimmy Stewart flew during his time overseas in WWII. If you saw the movie “Unbroken,” Louis Zamperini was shot down over the Pacific in a B-24. 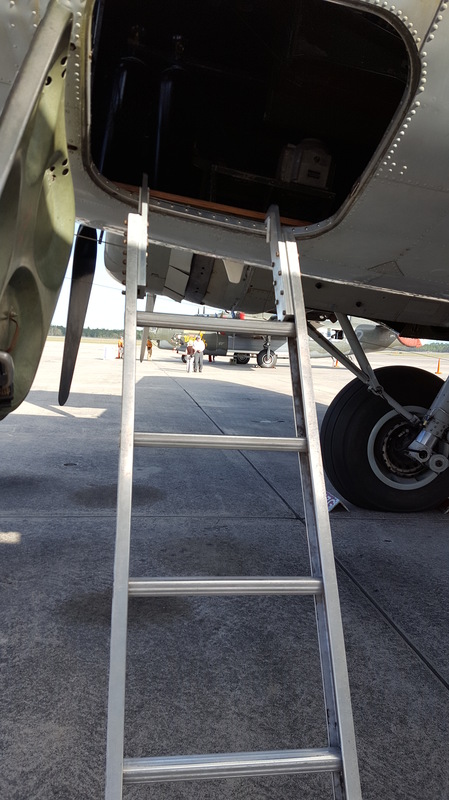 While inspecting the aircraft before we went on our flight in the B-17, we met a WWII veteran. 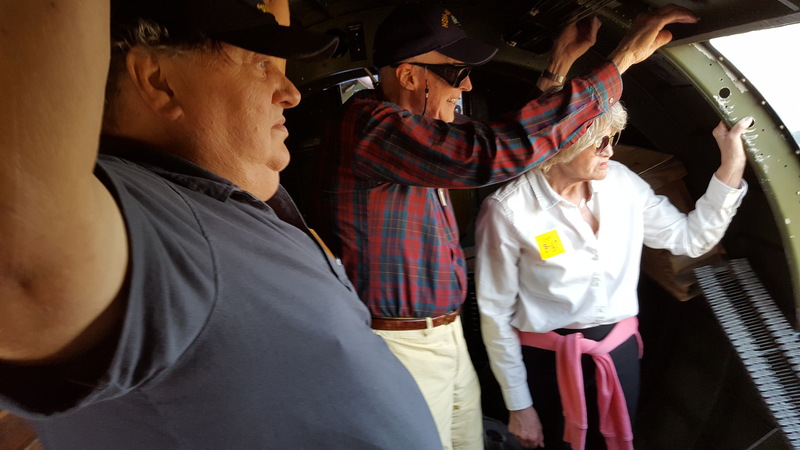 James Connelly was there to take one last flight in a B-24, the same plane he flew in during WWII. During the war Connelly flew twelve missions before his B-24 was shot down over Germany. He then spent nine months in a German POW camp. Mr. Connelly was fascinating and I hope to talk to him again. 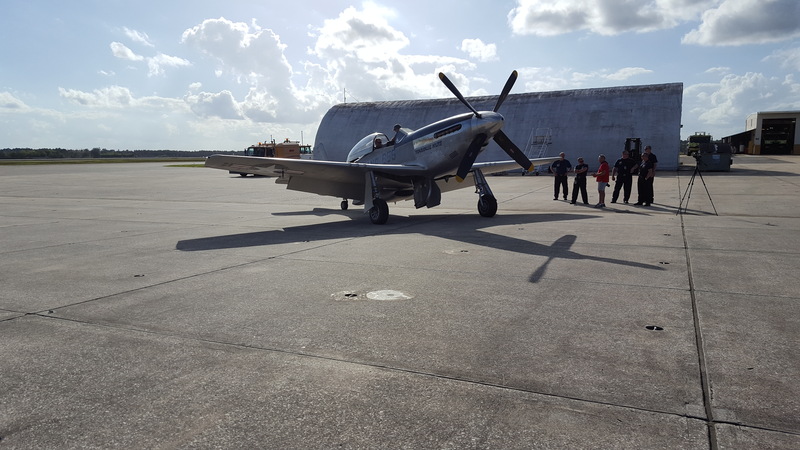 I got some pictures of the P-51 fighter as it sat on the runway ready to take off with a lucky passenger. As promised in my last post, here are more photos of the B-17 Nine-o-Nine that we flew on a couple of weeks ago. These were taken on the ground as we walked around and examined the plane before our flight. I’ve seen so many pictures of B-17’s, but a picture does not compare to seeing the airplane in person. 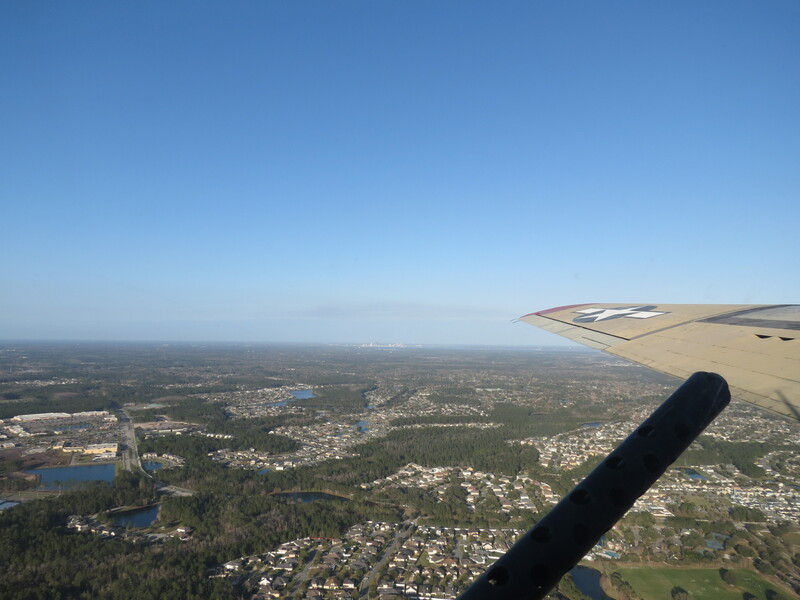 On Feb. 23, 2018, we drove out to Cecil Field to see the Collings Foundation’s Wings of Freedom 2018 tour. 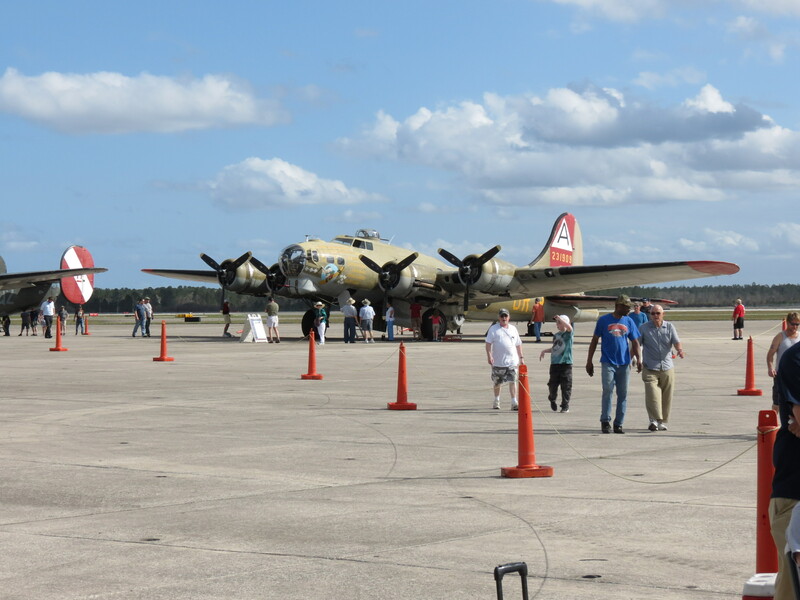 The main attraction for me was the B-17 G Nine-o-Nine. 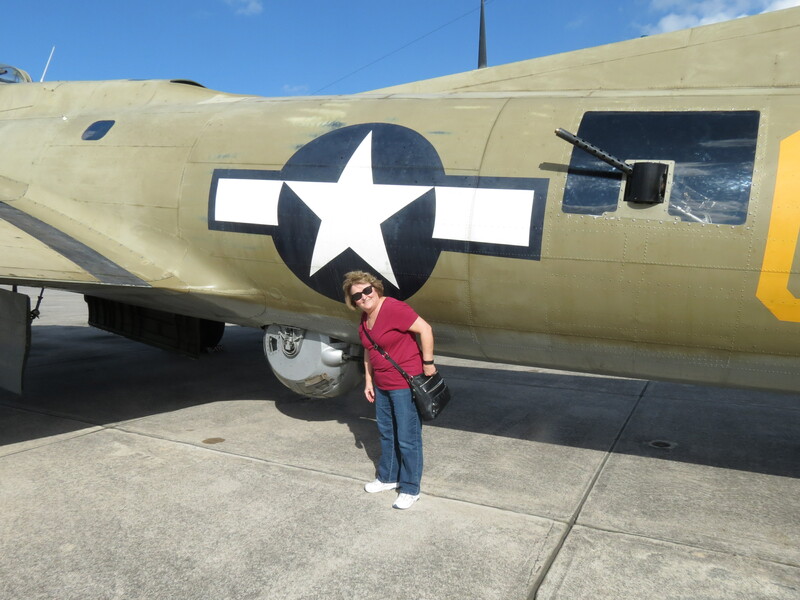 I’ve been fascinated with the B-17 from the time I began researching for what turned out to be my first published novel, Kitty’s War. In my novel, the hero is a navigator on a B-17 stationed in a fictitious air field in England as part of the U.S. Eighth Air Force. 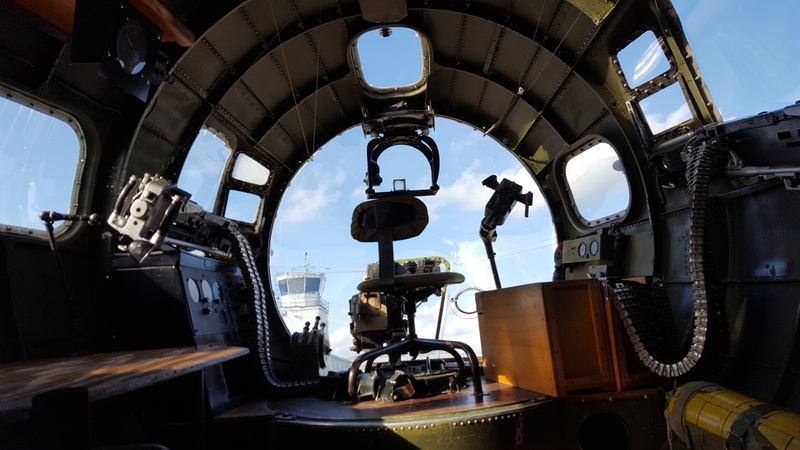 The B-17 G is a later version of the famous bomber which had the “chin” turret added in the front just below the navigator’s perch in the nose of the airplane. Since the German fighters often attacked the bombers from the front, flying straight into the formation, the designers added a gun position on the nose to fire at oncoming fighters. The Plexiglas surrounding the bombardier giving him maximum visibility. He used the closely guarded Norden bomb-sight to zero in on the target and drop the load of bombs. When under attack from fighters, the bombardier fired the 50 caliber machine guns in the “chin” turret. 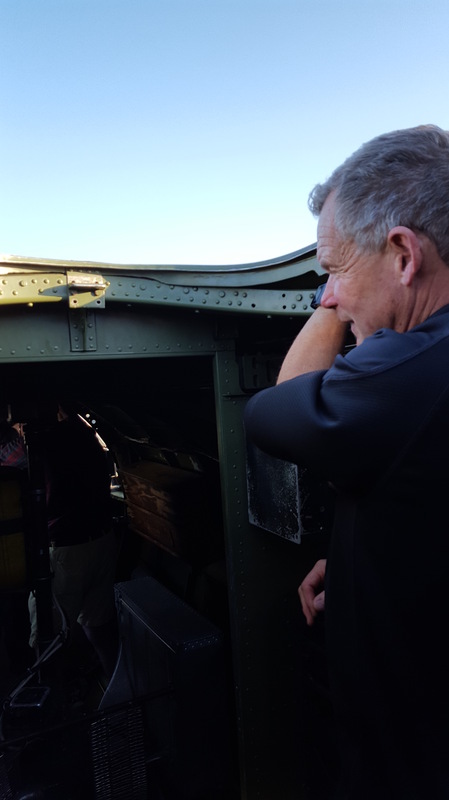 While the plane was still on the ground, I climbed inside to look around. This is the entrance the pilot, co-pilot, bombardier and navigator would have used to enter the plane. In movies and newsreels I’ve seen them jump up, grab hold of the top of the opening and pull themselves up into the bomber. The ladder makes it much easier. Once inside, I moved forward into the nose. Straight ahead you see the bombardier’s seat. 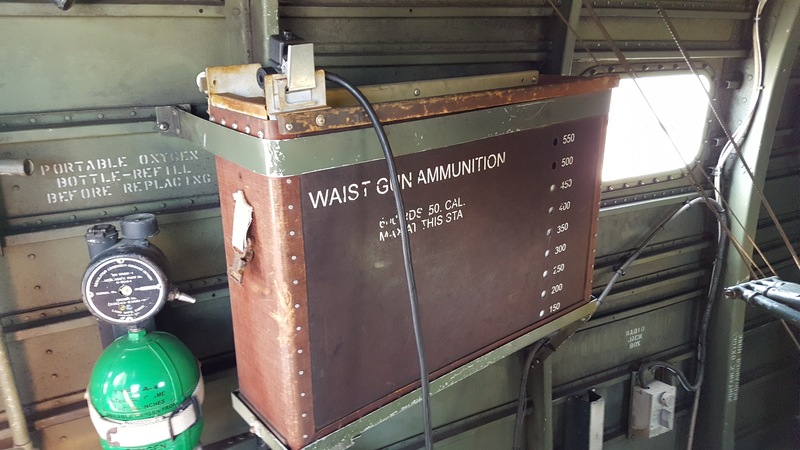 Note the ammo belts for the guns and the big wooden box for extra ammunition. 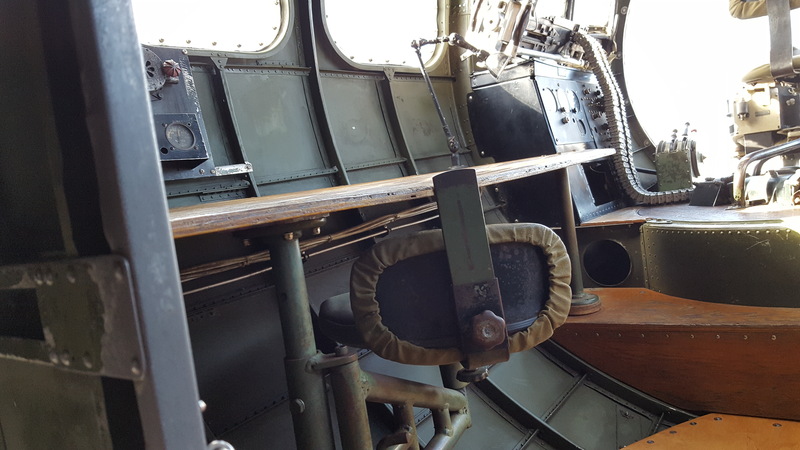 To the right of the bombardier’s seat are the controls for the “chin” turret guns. The navigator’s desk is behind the bombardier on the left. The navigator was also responsible for manning a machine gun. The navigator would have carried maps marked up with the day’s mission. These would have been given to him in the briefing prior to taking off. Although the flight path for the primary target and the secondary target were already worked out, if something went wrong, the navigator would have to use the maps and his training to get the crew back to their base, or at least back to England. Climbing back down I continued my walk around the airplane. Behind the wing, the ball turret is visible beneath the fuselage. In this swiveling device, the ball turret gunner could swirl around and shoot in almost all directions. 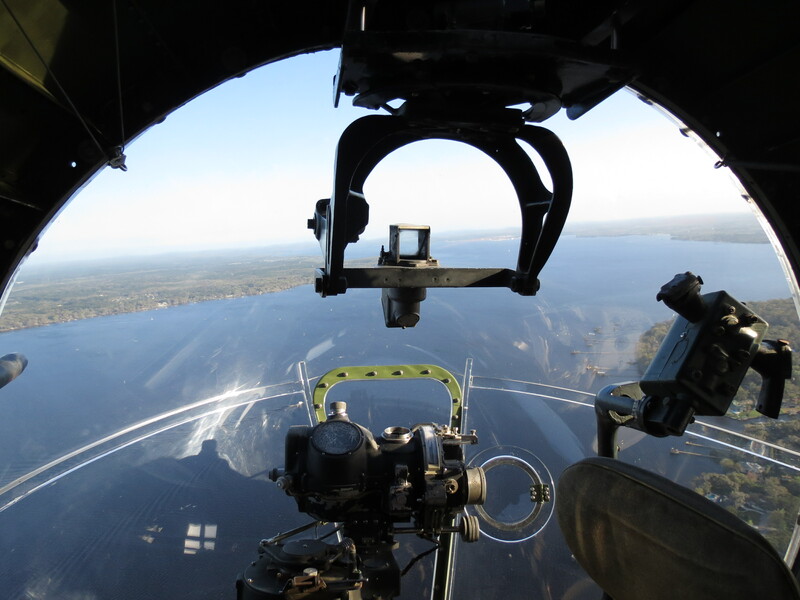 Shorter airmen manned the ball turret due to the cramped space in this position. 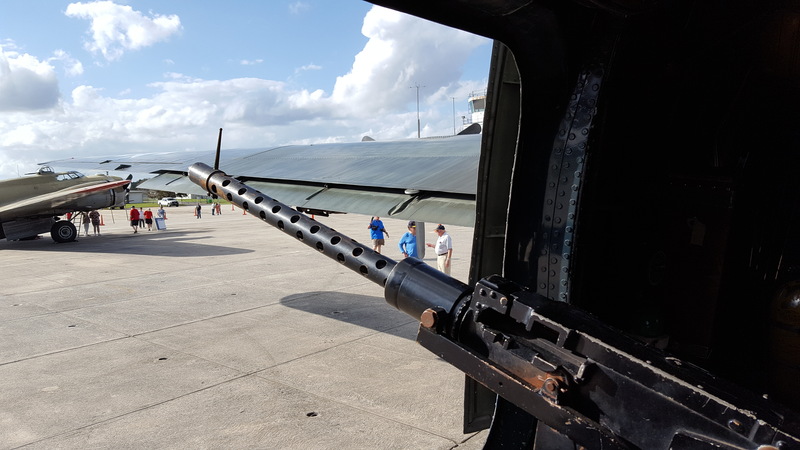 The tail gunner guarded the rear of the airplane. My husband is pointing to the gun sights in the small window. 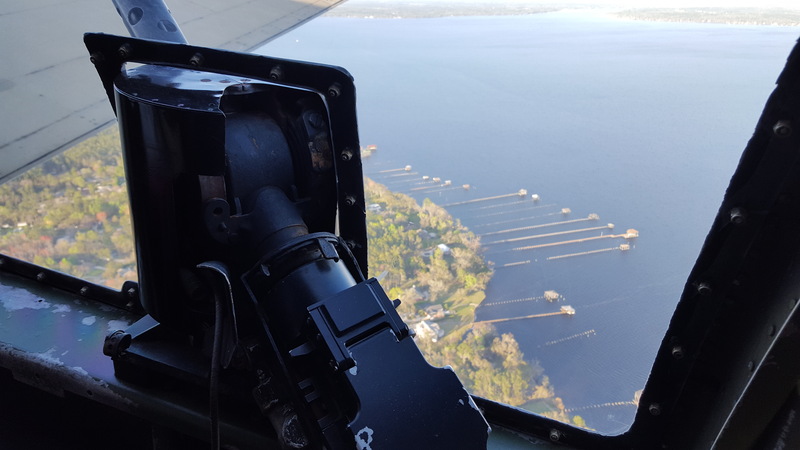 The sights would have been used to aid the tail gunner in aiming his guns. 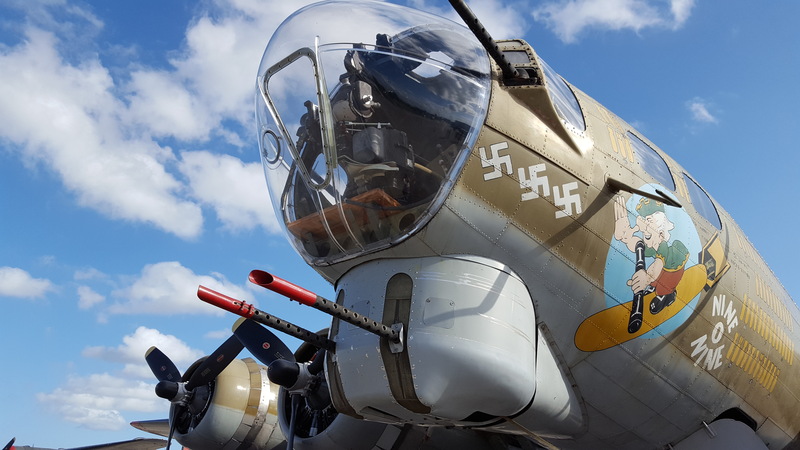 The Flying Fortress, as the Boeing B-17 was called, had thirteen 50 caliber machine guns which covered every direction to defend itself from enemy fighters. 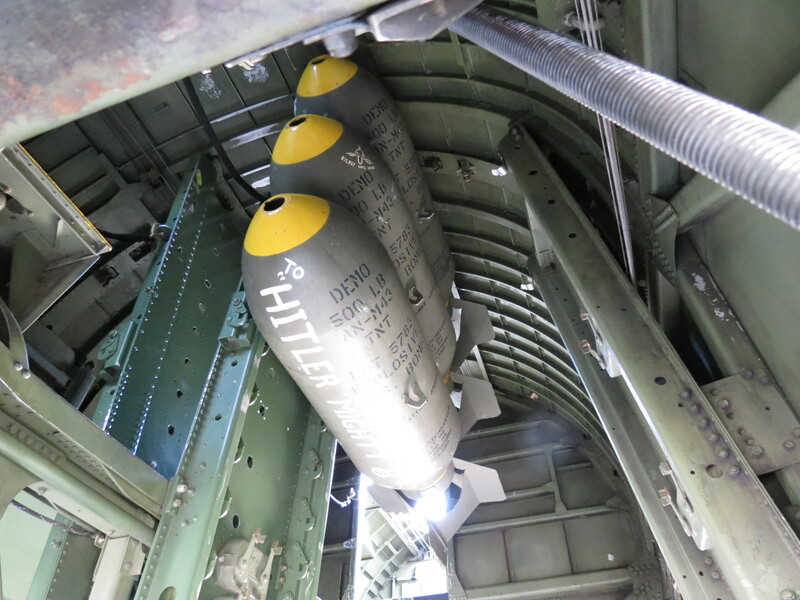 The bomb bay doors were open as the B-17 sat on the ground. So I stooped down and looked up to get this shot of the “fake” bombs. Cool view! 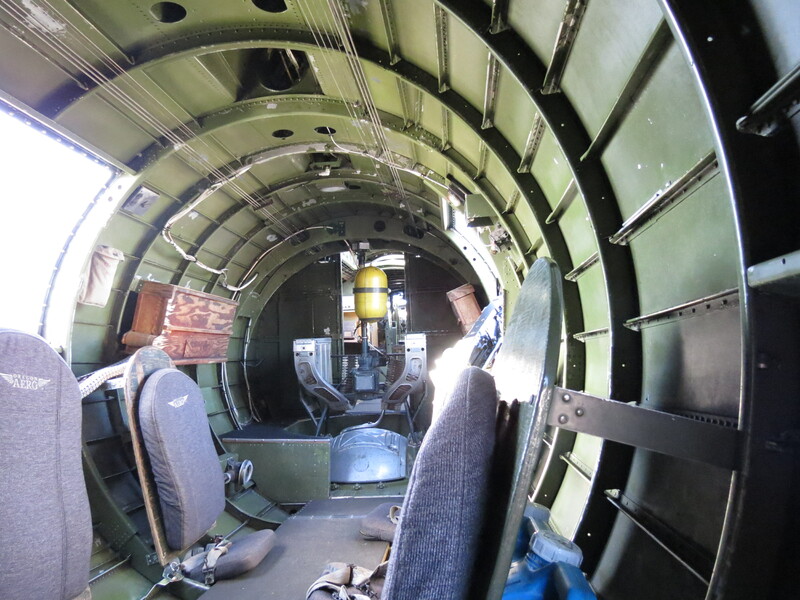 Inside at the waist gunners’ positions you can see the seats added for those of us who would fly. The seats consisted of a small cushion to sit on and a larger one to lean back against. Looking through the plane from here, at the rear entrance, you can see the top of the ball turret, then through the radio room and into the bomb bay. The large yellow bottle-like container in the center of the photo is an oxygen bottle. This airplane was not pressurized. When the altitude reached about 5,000 feet the crew had to put on oxygen masks so they could breathe. The oxygen masks were attached by long tubes to numerous oxygen bottles throughout the plane. This aircraft was also not heated. The crew wore bulky, padded, electrically heated suits and gloves to stay warm and prevent frostbite at high altitudes. 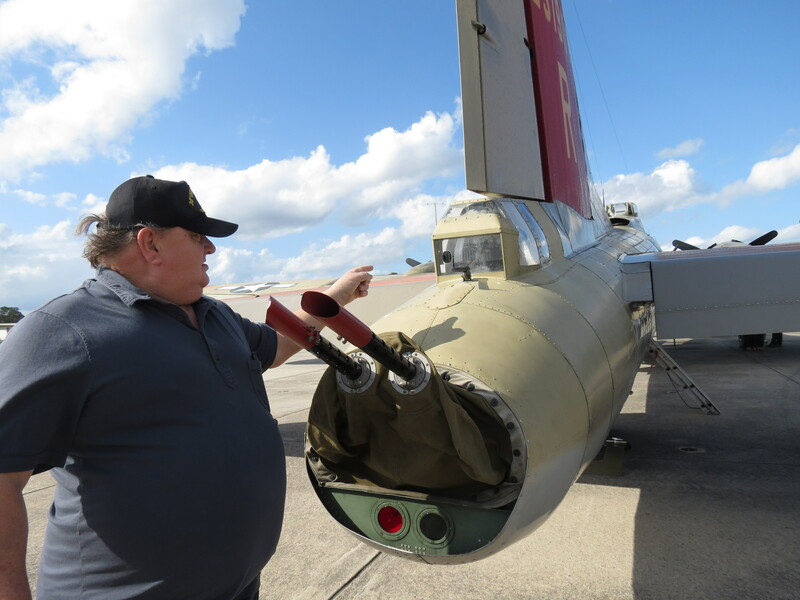 The contraption pictured here is the “put-put.” If you have read my novel, Kitty’s War, you will remember my reference to it during a mission when the plane is damaged. It is the back-up electrical generator used to provide vital power to systems if the main power supply from the engines was lost. Here is a close up of one of the four, powerful, 1200 hp engines. Finally, a parting shot of this beautiful bird. 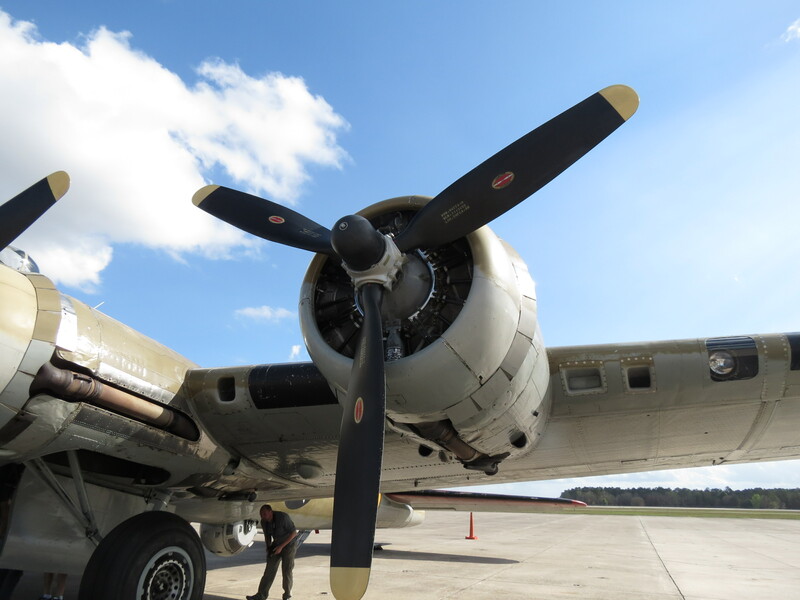 We had a great day both touring and flying in this fantastic B-17. 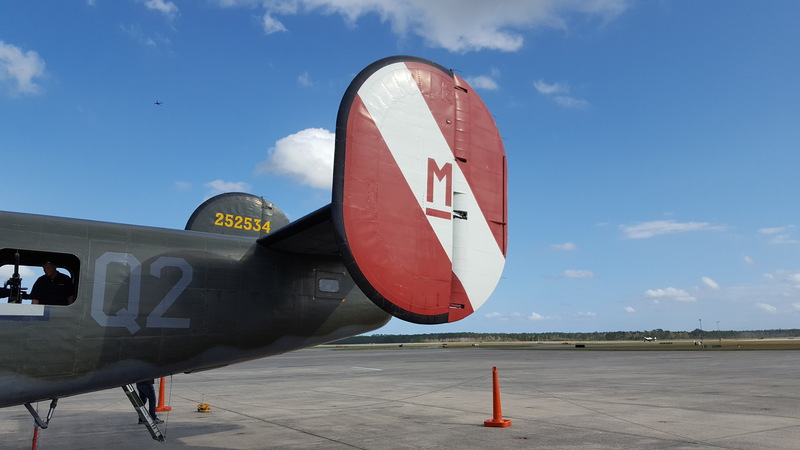 Thanks to the Collings Foundation for restoring these historic aircraft and for keeping them in flying condition so that the public can see them and experience flying in a World War II vintage airplane. What an incredible flight! 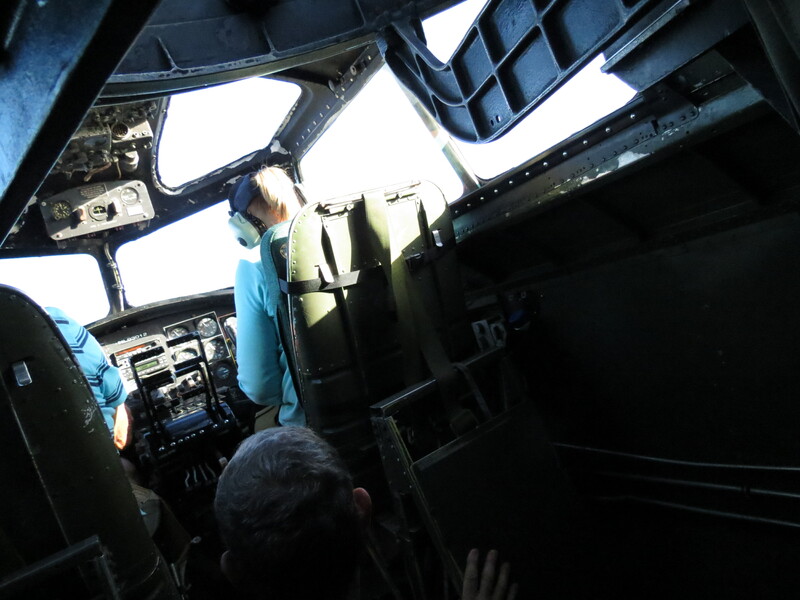 My husband and I recently flew in “Nine-O-Nine,” a WWII vintage B-17 G owned and operated by the Collings Foundation. 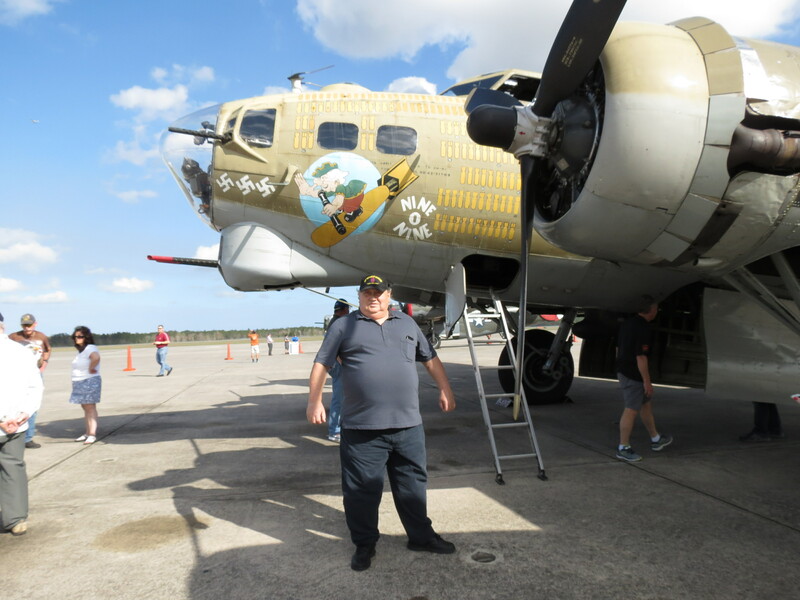 The B-17 along with a B-24 and a P-51 are touring the country as part of Collings 2018 “Wings of Freedom” tour. Since I took so many pictures that I want to share, I will split them up into more than one post. I’ll start with the in-flight shots on “Nine-O-Nine.” The on-the-ground pictures will be in a later post. Let’s start with me waiting to take off. 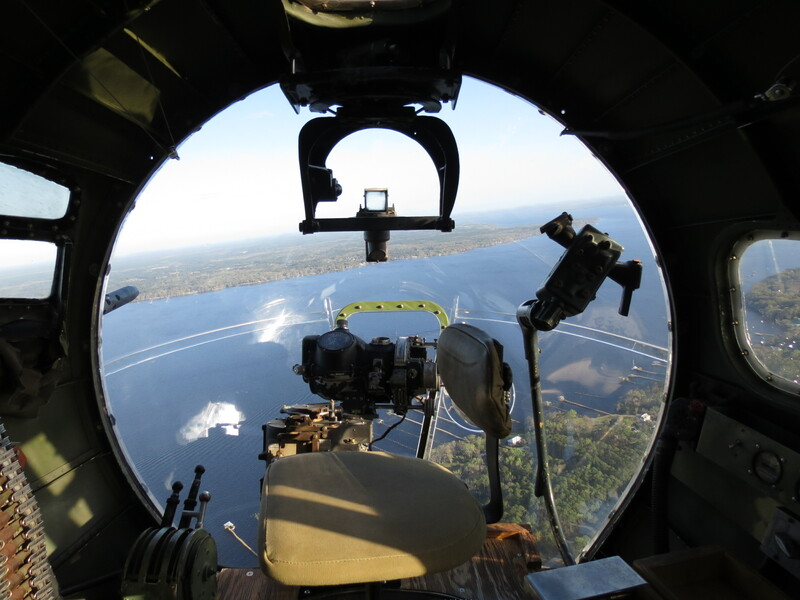 Notice that we are sitting on the floor in the waist gunner positions. No luxuries here. Once in the air we were allowed to move around in the plane so that’s what I did. 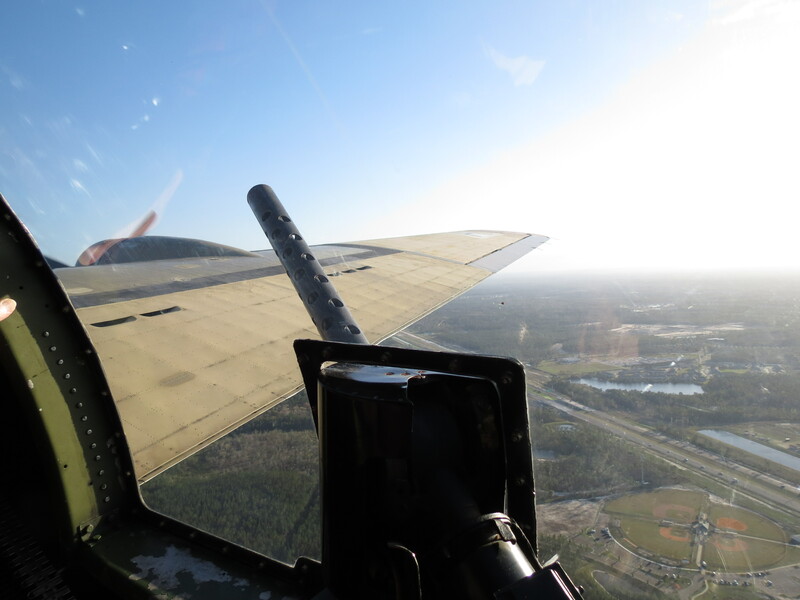 Here is the waist gun position looking out over the wing. Next comes a view of downtown Jacksonville way in the distance. We flew out of Cecil Field so we were a few miles west of downtown. It’s in the mist but if you enlarge the picture you can see the skyline. After getting my flight legs in the moving plane, I managed to find hand holds and made my way around the ball turret. 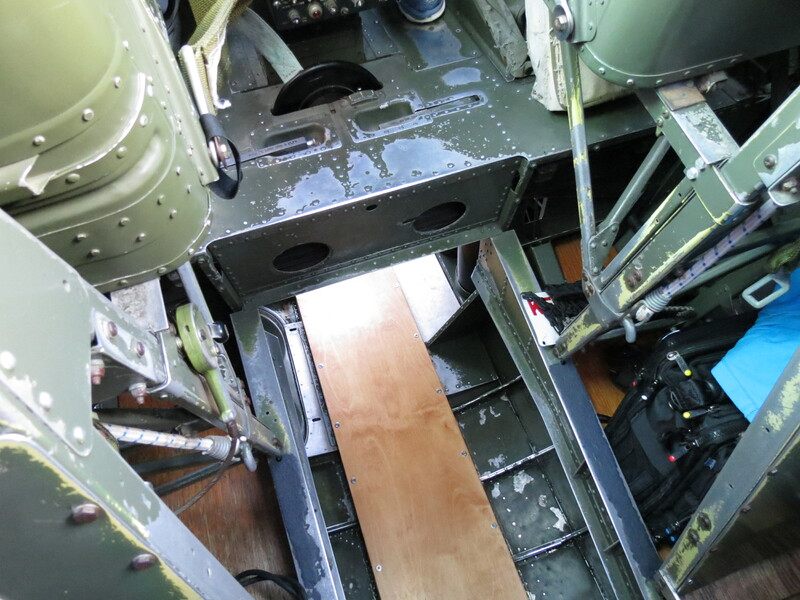 Looking down I could see daylight around the unoccupied gunner position. Not wanting to drop my cellphone when the plane made unexpected movements, I decided to put it away and only use the camera hanging around my neck on what was proving to be an unsteady journey through the plane. 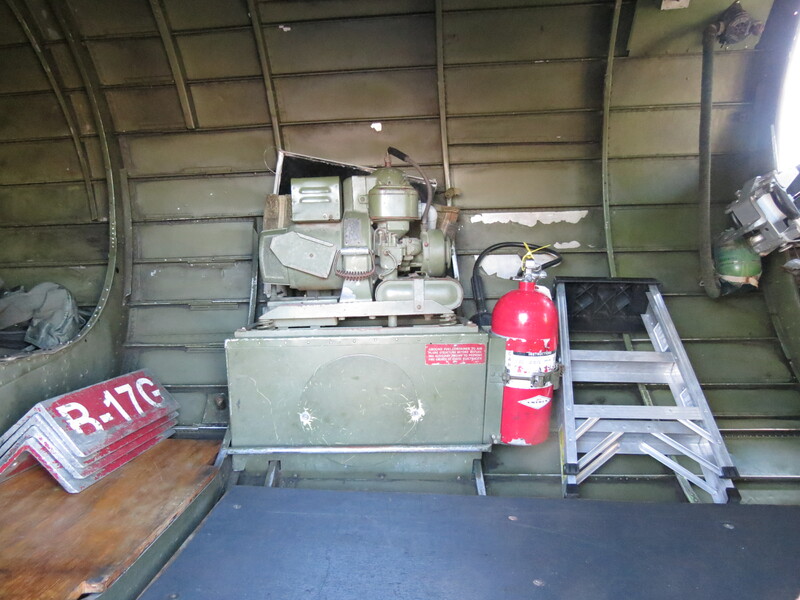 I moved from the waist gunner area forward into the radio compartment. There were eight passengers on board for our flight. 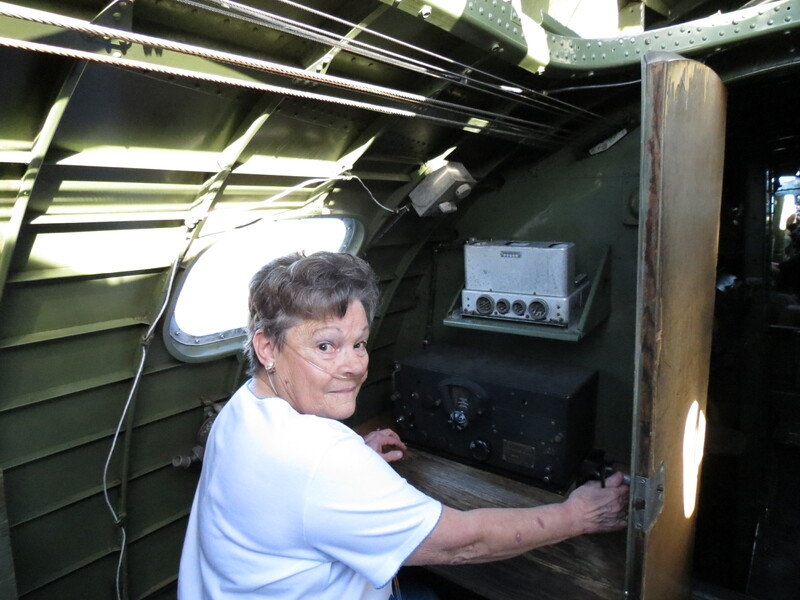 This lady sat in the radio operators position. Beyond the radio compartment is the bomb bay. Notice the narrow walkway, just wide enough for my foot, and the small ropes to hold to steady yourself. The v-shape of the bomb supports made for a tight fit as I squeezed through grabbing for something solid to hold onto. 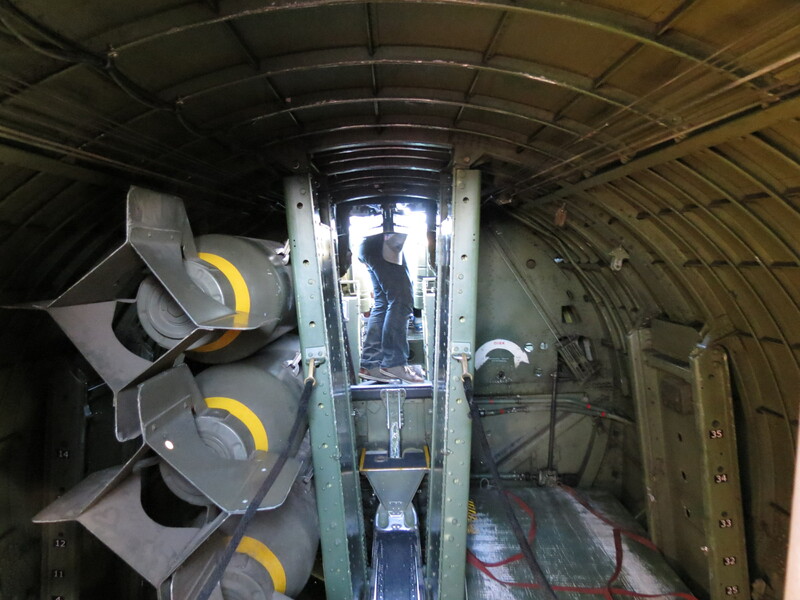 Imagine having to do this at 20,000 feet with the bomb bay doors open. Not for the faint of heart. Beyond the bomb bay is the flight engineer’s position right behind the pilots. Here the top was open. Very windy for the passenger looking out. Out to the side the flight engineer could view the engines from his spot behind the pilots. We were told not to talk to the pilots during the flight and, believe me, we all wanted them to focus on flying this large, four-engine airplane. They did a fabulous job. Notice that the co-pilot is a woman. Reminds me that the WASP pilots flew B-17’s around the U.S. during the war. Now down into the small passageway leading to the nose. 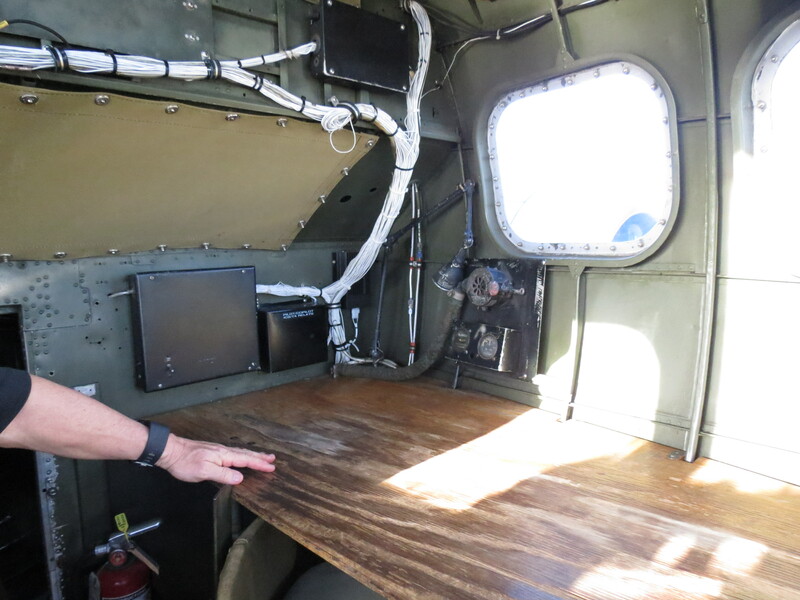 I had to drop down to the wooden surface, and then get down on my hands and knees and crawl into the nose where the navigator and bombardier sit. Straight ahead is the bombardier’s position surrounded by Plexiglas. Notice the gun sight in the center and the machine gun that he operated. On the left side of the nose is the navigator’s desk. This would have been where the hero in my novel, “Kitty’s War,” sat. Again, there is a machine gun, not in the picture, that he fired when needed. 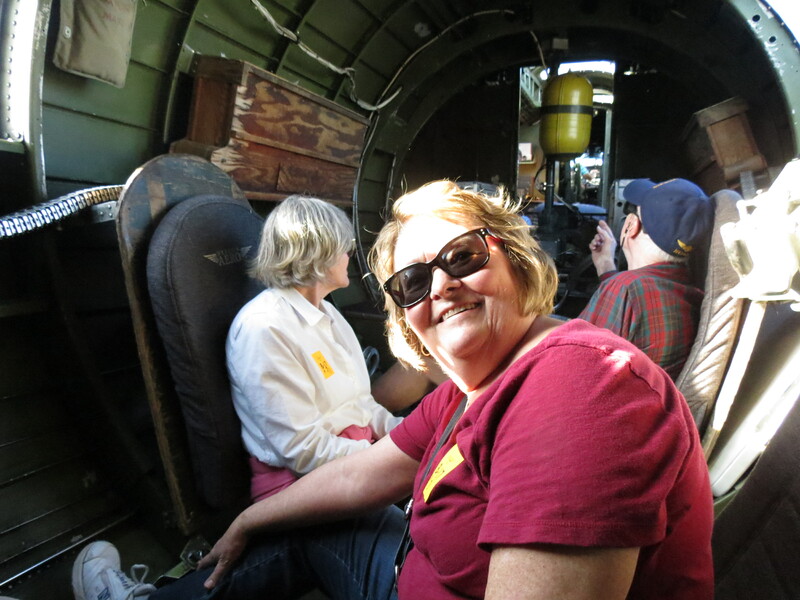 Back in the waist gunner positions my husband and two other passengers look out the windows. Another view out the windows at the river below as we head back to the airfield. 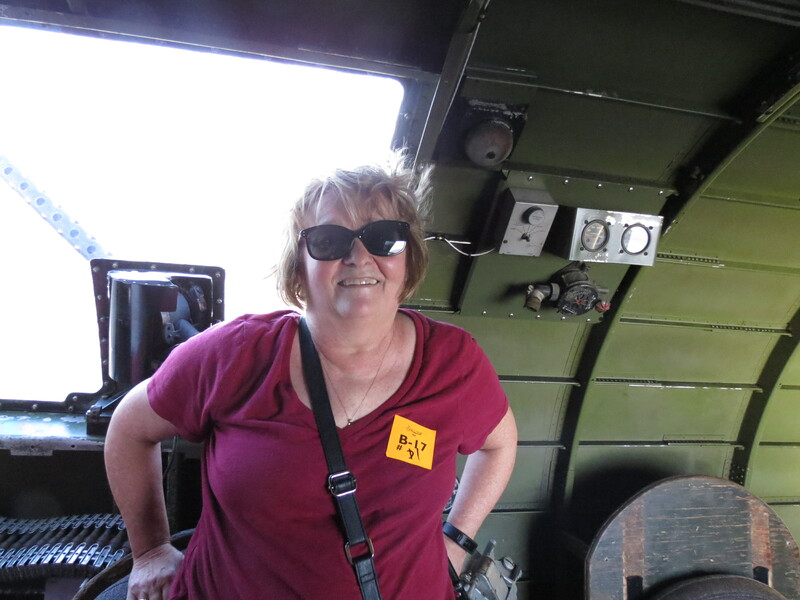 And, finally, me standing in front of the gun at the waist gunner position with my wild “bomber” hair style. What a fun, once-in-a-lifetime experience.